Located in the state of Himachal Pradesh, beneath the snow-clad peaks of the Himalayan Dhauladhar, is this hill city, Dharamshala, which is the home to Dalai Lama. The Thekchen Choling temple in Dharamshala, also known as McLeod Ganj, is a place of great spiritual importance for Tibetan Buddhism. Fenced by cedar woods, it is a serene area with hills, picnic spots and offers magnificent spiritual qualities. Triund hill, one of the major attractions is a one-day trek, just 9 km away from McLeod Ganj. Dharamshala, for years now, has been a haven for yogis and explorers. It beautifully collaborates Tibetan and Indian societies, forming a perfect blend of cultures. Chimay Yoga offers Yoga Teacher Training in this perfect location, amidst the beauty and the diversity. Cultural diversity – Imagine meeting people from all different countries, exploring different diversified cultures and rituals and growing as a person. Yogic food – We serve healthy and hygienic food (3 meals) on weekdays and breakfast on Saturday to keep you fit and healthy. We even grow a lot of organic stuff for our students! Comfortable Stay – The stay we provide is very cozy, comfortable and modest. Local culture – During weekends, you can explore the local culture in McLeod Ganj. All the places are mentioned below. Students Satisfaction – We work for you, we believe in giving the best experience to our students in all the ways possible. Affordable price – We do not believe in making profits from such a noble profession, we only charge you for your accommodation, food and teachers. Hence, we are able to give you the lowest price with the best experience. Dharamshala is an hour-long flight from Delhi. It is surrounded by interesting places and towns like Bhagsu and Dharamkot, waterfalls and ice sheets. One can indulge in various activities like trekking, Vipassana contemplation, culinary courses and many others. Apply for Yoga Teacher Training in Dharamshala and avail the opportunity to enjoy all of these. For a passionate explorer, Dharamshala is like a heaven, exciting and beautiful with a spiritual touch. Dharamshala is in the center of various trekking trails leading to Dhauladhar into the upper Ravi Valley and Chamba. Trekkers go through timberlands of deodar, pine, oak, and rhododendron, accompanied by streams, waterfalls and ice sheets to reach their destination. Bhagsu is a 2 km walk, 3 km further will lead to Dharamkot. However, if that does not suffice, one could an 8 km walk to Triund. Also, the snowline of Ilaqa Got is just a 5 km walk away. Tsuglagkhang Complex, which is situated on the Temple Road, is a religious attraction. 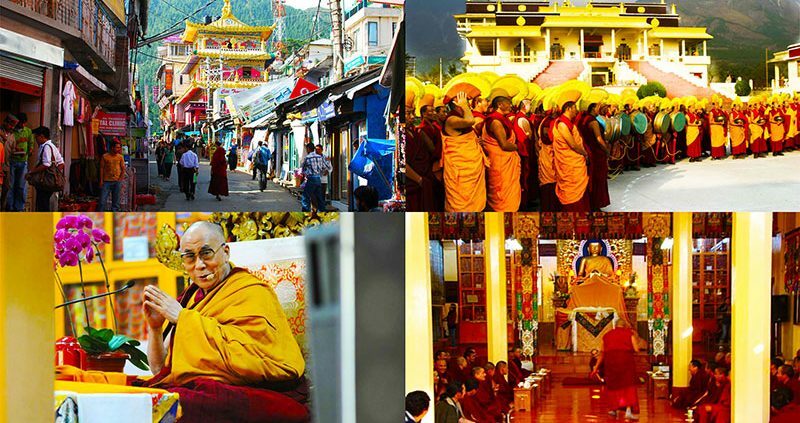 It is one of the most famous destinations, assembled by His Holiness, Dalai Lama, himself in 1959. Namgyal Monastery stands out amongst the other tourist spots in Dharamshala. It accommodates about 200 ministers; this religious community is the biggest outside Tibet. The prayer wheels the stylistic theme and general veiling plan is outwardly engaging and inviting. DO NOT MISS the prayer room and meditation sessions of the monks. Named after its holy partner in Kashmir, Kaneri Dal Lake is a magnificent and extremely different from other attractions. This lake is surrounded by rich green deodar vegetation and snow-capped mountains. With activities like boating and Kali-Shiva temple on the banks, it is a splendid spot to visit. Bhagsunag Temple is devoted to Lord Shiva. It is one of the oldest temples and the most frequently visited spots in Dharamshala. It is situated between grandiose slopes and trails. The beauty of this temple has made it quite a fascinating spot. Do not forget to take a holy dip in the freshwater man-made pool and the fest if you go there in September. Do not avoid this destination. The waterfall is at a height of 20 m and surrounded by flawless beauty. The chilled milky water looks the best during rains. It is also a well-known trekking stretch and one of the most amazing spots to visit in Dharamshala. Take a dip in this ice cold water and remold your mind and soul. Dharamshala serves not only as the best holiday destination but also the most suitable for a spiritual exploration and mental peace. Breakfast, Lunch, and Dinner for weekdays and breakfast on Saturday. We even grow a lot of organic stuff for our students! Useful things like Yoga Mats, Yoga props and other necessary things related to yoga will be provided. Yoga manual is given to students and there are books on yoga for students to read. A homely environment for all students as we consider them to be a part of our family. All rooms and yoga hall have heaters installed, making the center a warm and a cozy place to stay in. Heating blankets are also provided if someone feels cold. Know more about our 200-hour multi-style yoga teacher training course and 300-Hour YTTC Program! You can enroll for the upcoming courses from by filling our Student Application form. You can also contact us if you have any queries regarding the Yoga Teacher Training in India.